Camera addict? 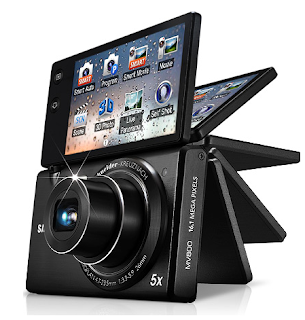 You should try this unique camera design from Samsung.Introducing Samsung Multiview. A slim, sleek, minimalist form that’s as impressive as its photographic functions. The camera’s striking, sensuous front case is uniformly crafted and complemented by the stunning 3.0" flip-out display. Shoot, create, and view your life from all angles with the Samsung MV800’s flip-out display. Life’s more fun when you can cover all the angles.